It is part of the J H Harvey Collection at the State Library of Victoria.John Henry Harvey 1855-1938 was the photographer and captured other images on Berowra Creek and in several other Australian states. The two boys in the row boat in the foreground could be posed just for the photo. What do you think? Or maybe you recognise them? Does anyone happen to know the location of Merriman’s Bay Berowra Creek ? The image above is an idyllic view of Berowra, a place of fun, leisure and relaxation. In the foreground, a man enjoys a day on the water, casting his line and waiting to see what bites. Fishing has long been a popular pastime at Berowra though, and drew crowds from the city on a regular basis to try their luck. 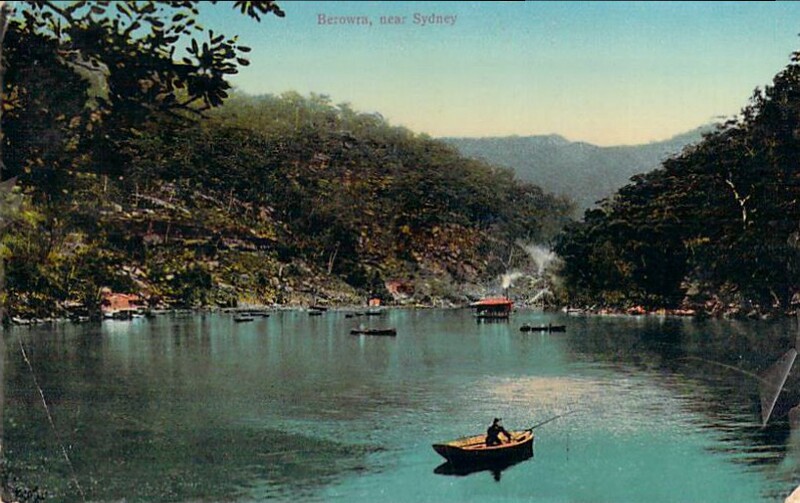 In fact, so popular were Berowra and Cowan Creeks that they were regularly mentioned in fishing reports in newspapers, including papers like the Sydney Morning Herald! Do you have memories of fishing at Berowra or Cowan Creek – or perhaps a story about the one that got away? We would love to hear your memories! This week, with the beginning of the New Year well underway, and school returning I recently found myself hanging up a new calendar for 2015. 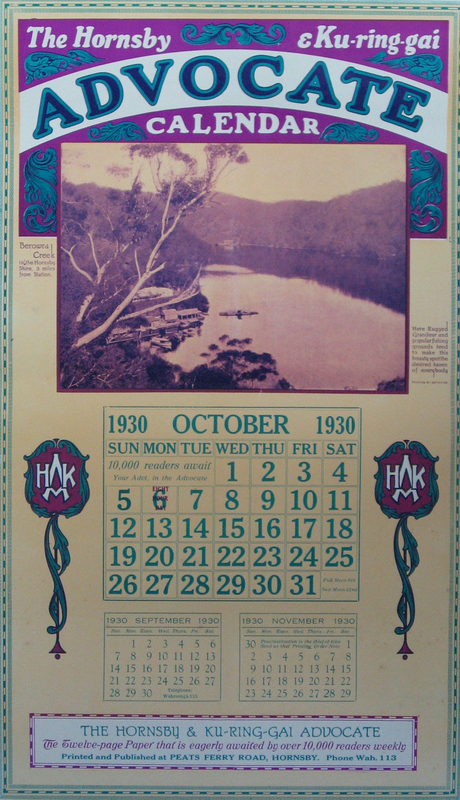 This brought to mind an image shared with Berowra Living History, showing Berowra and appearing on a locally produced calendar in 1930. The Advocate, a popular local newspaper which is still printed today, once printed this stunning calendar, and presumably distributed it to the local residents in their delivery area. 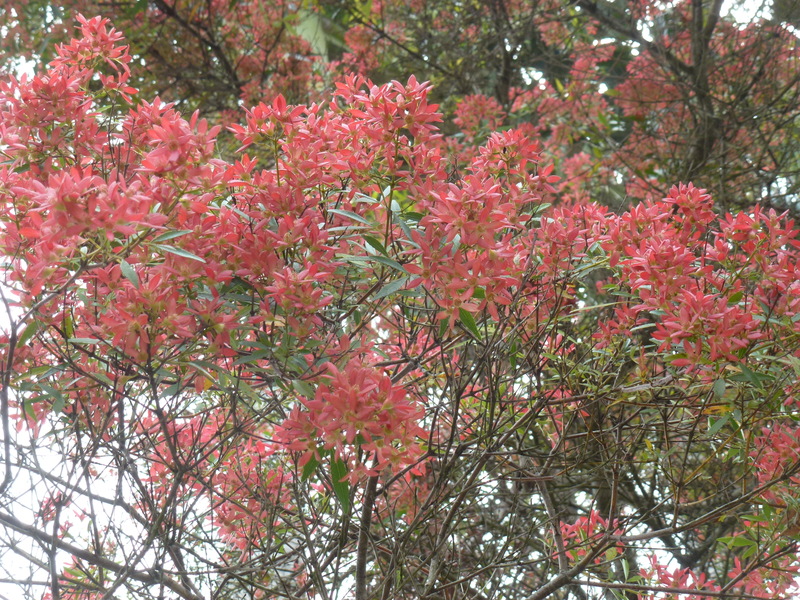 Little is known about the calendar, and sadly, only a one or two pages of the original 12 have been sighted. Do you know anything about this calendar, or perhaps do you have a complete copy tucked away in a cupboard? Do you happen to know if any others were ever produced? Was the calendar free? If you know the answer to any of these questions, we would love to hear from you! Our thanks to Pat McCready (nee Ewings) and Shirley Collins for the image above. 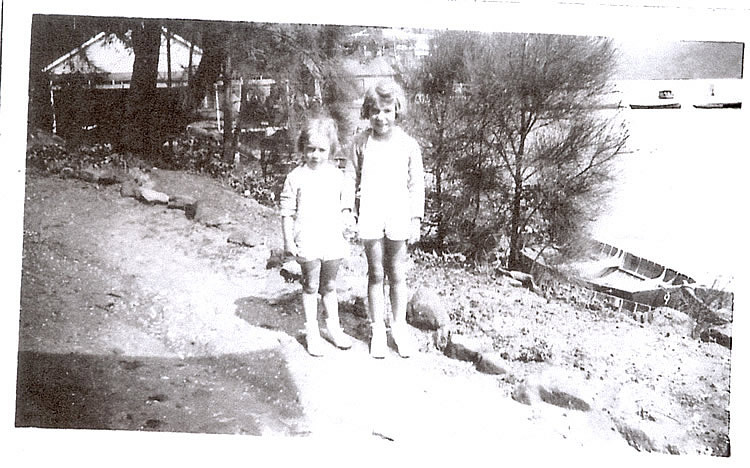 It shows Pat Ewings aged 6 and her sister Jill aged 4 standing on the path to the Ferrykeeper’s Cottage at Berowra Waters in c. 1943. The girls’ father, Bill Ewings was a long serving Ferry Master. And yes, they were the very welcome babies celebrated by our stork flag in our blog of 21 November. The flag was made by Nell Vivian and flown on the community flag pole near the then Vivian’s Boatshed. There had not been a baby born to the Berowra Waters Community for 18 years till Pat was announced. Her celebration was to be followed by the flag with two stripes being raised for her younger sister, Jill’s arrival!